A Route 40 minibus driver plans to take legal action against several traffic ranks of the Brickdam Police Station after he was allegedly beaten and left with a dislocated shoulder and bruises to the body. The incident, which occurred on Monday night, started in the Stabroek Market area and ended near the Brickdam Police Station. 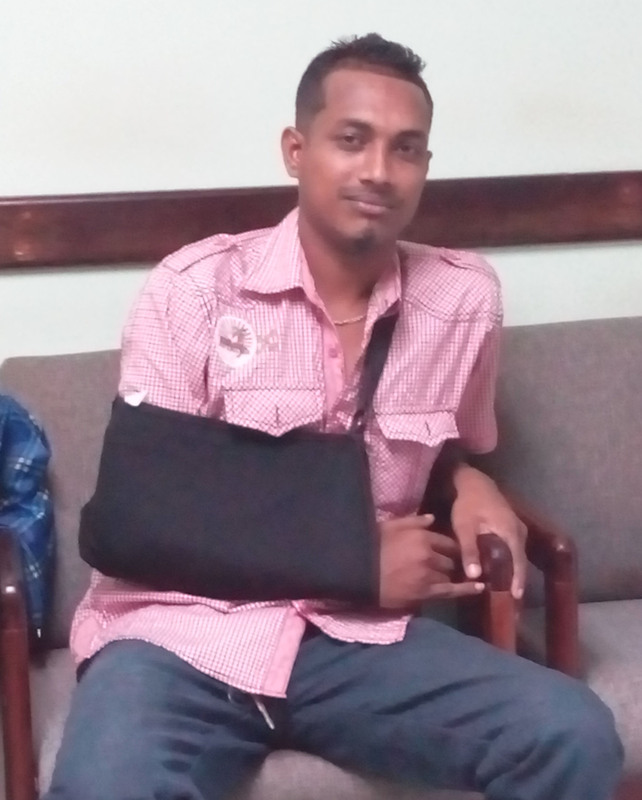 When the driver Semong Sawh spoke to Stabroek News on Wednesday in the presence of his attorney Glenn Hanoman, his right hand was in a sling and he was in pain. The sling has to be worn continuously and ice applied to the dislocated shoulder regularly. Stabroek News was shown pictures of the bruises that the man sustained along with a medical certificate obtained from a private city hospital. What is even more traumatizing for Sawh is that he was denied medical attention for hours and was only able to see a doctor after he was released on $20, 000 bail on Tuesday afternoon. He has since been slapped with three charges – resisting arrest, disorderly behaviour and assaulting the police and was scheduled to appear in court yesterday. 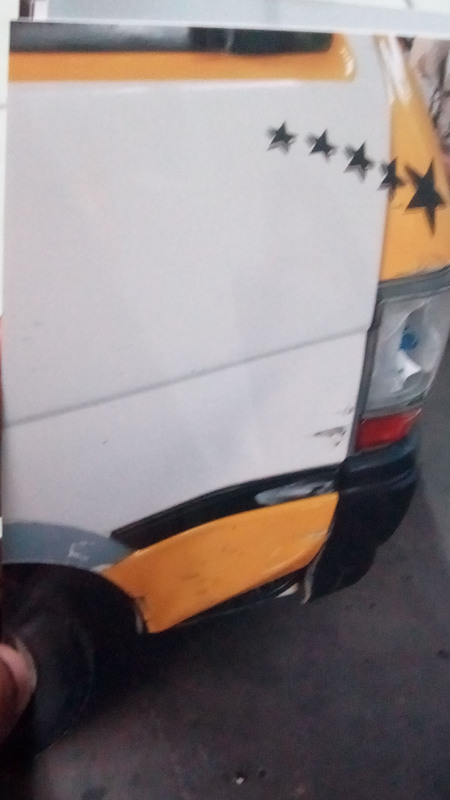 The damaged driver side bus door. When contacted, Division Commander Clifton Hicken said he was unaware of this matter as no report was made to him. He later urged that Sawh visit him. Based on what Sawh and his attorney related to this newspaper, Sawh had an exchange with a policewoman at the minibus park during which it is alleged that the rank used foul language. Sawh responded in a like manner. He then made a trip and when he returned at around 9pm, Sawh said a group of policemen surrounded his minibus and attempted to pull him out. He said he resisted and indicated that he would go to the nearby police station. Sawh told Stabroek News that one of the ranks pulled out the key from the ignition and jumped into the bus. He said while this was happening, two ranks were trying to physically remove him from the vehicle and during the process, were hitting the driver-side door. The bottom of the door now has a dent and cannot close properly. The man related that he drove off but had to stop at the nearby traffic light after it turned red. He recalled that when he drove off from the park, one of the ranks ran after the vehicle and when the bus stopped at the red light, he was able to catch up. The rank made another attempt to physically remove him from the vehicle. “I had to jump the light and go cross and meet the other corner and when I go across the other corner, he (the other rank) start hitting me in me head,” Sawh related. “He vice me and hit me head on the bar,” the man said adding that he continued driving and did not realise that he had passed the entrance to the police station. “He is to pull me hand off the steering (wheel) and the bus lose control and hit the brick and went in de corner…police come and apprehend me right deh and carry me to the station,” Sawh recounted. He added that the assault continued even as he was taken into the station. He alleged that another policeman cuffed him several times to the head. Hanoman said his client was not allowed to make a report about the assault although he had requested it. 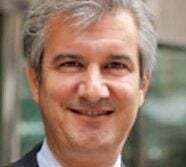 The attorney said he was particularly disturbed at how his client was treated afterwards and about the fact that one of the ranks implicated apparently finds the entire incident funny. He said his client had to go to a private doctor who examined him and discovered the dislocated shoulder and abrasions to the body. The attorney is adamant that the police cannot arrest persons for minor traffic offences. Sawh will be lodging a complaint with the Police Complaints Authority.